Shilajit - "Secret of the ages"
In ancient Nepali holy text, Shilajit translates into "the destroyer of weakness". Shilajit is often referred to as a Rasayana or Rejuvenator. What are the active ingredients in Shilajit? What makes Fulvic Factor unique compared to other Fulvic Acid products? 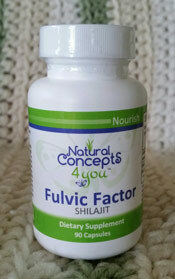 "I have two really great experiences with Fulvic Factor that I would like to share. A few years ago I did some exercises and did something real damaging to my knees. I went to my medical doctor and he said I would have to have about $4,000 work done in repairing the damage. Well, I can't afford that, so I suffer with pain. The week before I started on Fulvic Factor, the pain in my left knee was really bothering me, the worst it ever had been. I have to go up and down the stairs a lot and I was having to hang onto the handrail to help me get upstairs. Since being on the Fulvic Factor the pain has gone away and I find myself running up the stairs with no problem.